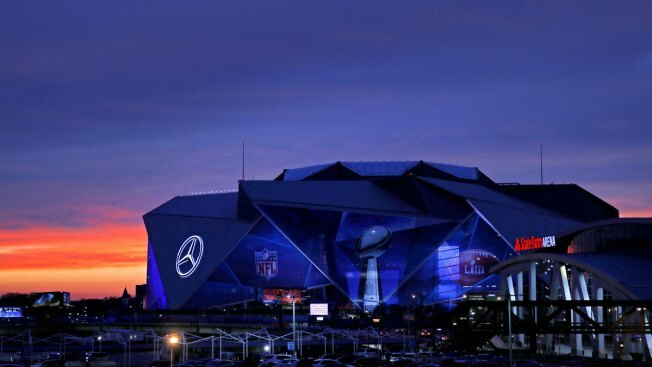 An exterior view of the Mercedes-Benz Stadium in Atlanta on Sunday, Jan. 27, 2019. While thousands of football fans with Super Bowl tickets are converging on Atlanta, two families are mourning young black men who were killed in separate police shootings this month, both of whom are believed to have been unarmed, NBC News reported. Jimmy Atchison, a 21-year-old father of two, was shot last week after leading police and federal agents executing a warrant on a foot chase. His aunt, Tammie Featherstone, said police put the case "on the back burner because of the Super Bowl," though an Atlanta police spokesman disputed that and said the shooting is still being investigated. A week before, 18-year-old D'ettrick Griffin was shot while stealing a car at a gas station. It belonged to an off-duty officer; the case is now being investigated by the sheriff's office. A coalition of civil rights groups has planned a Saturday rally near Mercedes-Benz Stadium, where the Super Bowl will be played, to highlight Georgia's continuing struggles with policing.